London: Tho. Dring, 1673. Second Edition. Hardcover. 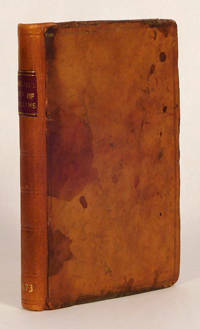 Octavo, , 165, , 117,  pages; VG; in contemporary binding, 1/4 bound in brown leather, paper boards; moderate wear to binding, including significant rubbing to boards, bumping to corners, chipping to head and tail of spine; browning as usual to pages; title page plus the following three pages show some tattering to the fore and lower edge, presumably from handling; leaf B1 has a chip missing to the lower fore corner; two small closed tears to C4; upper fore corner of second title page for Latin poems has a small closed tear; mathematics in ink on s8 margin; lacking rear endpaper; A⁴, A-S⁸; with deep printing;In 1673, a year before his death, Milton issued a revised and expanded edition of the Poems. ;Signature of John Wigan on leaf A2, A2, B8, H7 (twice); HJ intials on front pastedown, title page, A1,JG consignment; shelved case 0. Dupont. Lexicon universale historico-geographico-chronologico-poetico-philologicum I-II (and) Lexici Universalis Historico- Geographico- Chronologico- Poetico-Philologici Continuatio I-II. Basel, Widerhold 1673-83. (16),1964 + (6),600,120,(34) + (12),1063,(1) + 963,(1),260 pages. Folio. In 4 intact, old, worn, and to some extent repaired full leather bindings. Frontespiece is missing. Some of the first and last leaves wrinkled. 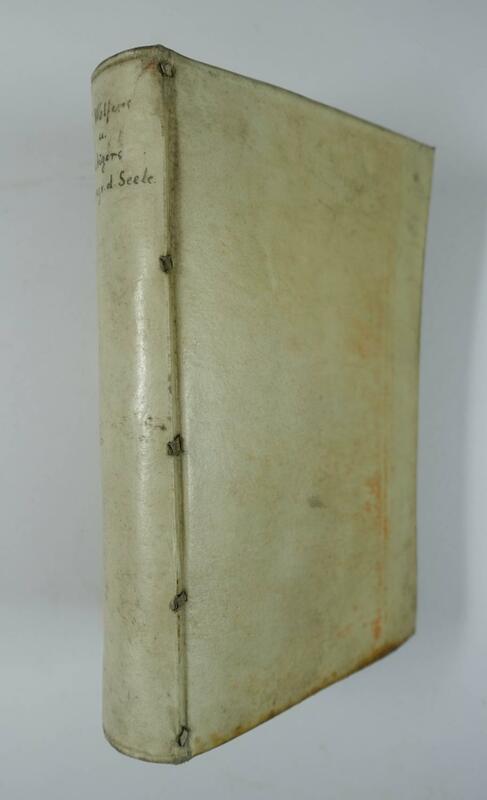 Only edition (of two variant printings) of Brydall's first introductory treatise on English law, to be followed by his 'Enchiridion Legum' later in the year, "clearly written; and . . . doubtless useful to the students for which they were intended". Contemporary sheep, somewhat stained, neatly rebacked, the top margin cut a bit close (no text affected), else quite clean; the Taussig copy. Printed by John Streater, Eliz. Flesher and H. Twyford [etc. ], London, 1673. London:: Printed by the Author..., 1673., 1673. Large 4to. [417 × 266 mm]. , 253 pp. 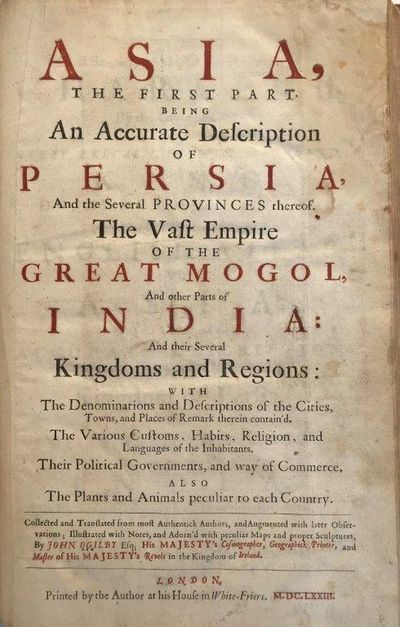 With 34 engraved plates, including 14 large double page folding maps or city views + 17 full-page engraved plates, and 30 engraved illustrations within the text [totaling 64 illustrations], title printed in red and black, dedication to Charles II, Mongol vocabulary [pp. 129-133], index and plate list for binder (at rear). Recent dark sprinkled calf to style, new spine & endpaper, repair and some professional restoration towards the gutter on the frontispiece, title page, and last leaf, some mild soiling also to these leaves, otherwise light browning, occasional spots, and a few minor edge-splits some with professional repair, but overall a very good copy. PROVENANCE: Bookplate: The Explorers Club Collection; presented by James B. Ford. Signature of Edwin F. Hatfield, 255 Madison Street, New York. Very rare. FIRST EDITION OF OGILBY'S CLASSIC WORK ON ASIA. Although described as a first part, no second part was published. DNB suggests that the second part of this work, always regarded as a separate publication, was Ogilby's Embassy to the Emperor of China, 1669, and published in a second edition in 1673. John Ogilby, born near Edinburgh, he won favor as a courtier to the Stuarts, and as an accomplished dance teacher. He even invested in a Virginia plantation at an early age. At the Restoration and under Charles II he made himself indispensable to the court and became a prominent London publisher, notably with editions of the Bible, translations of Virgil, Homer and Aesop's Fables. 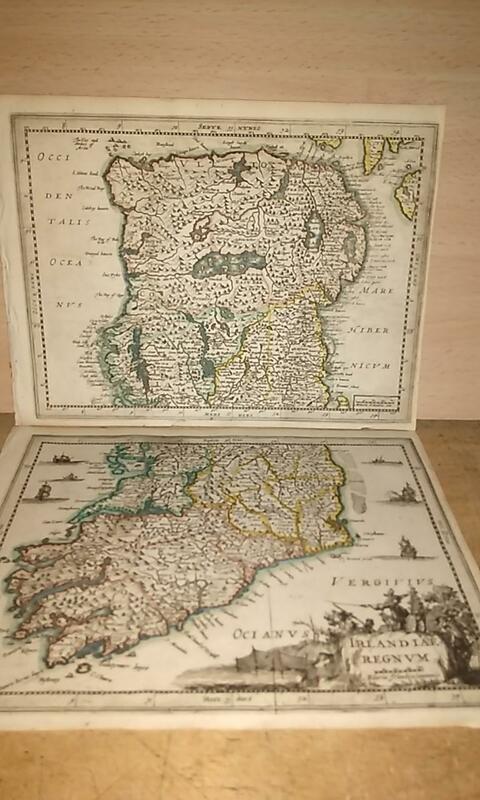 His road maps and histories of Africa (1670), America (1671) and Asia (1673), were all highly regarded, being replete with large engraved plates and maps. The DNB tells of "many splendid books, mostly in folio..." illustrated by prominent engravers including Hollar. The Great Fire of London in 1666 destroyed his premises. The DNB also details the criticisms leveled toward Ogilby by figures such as Pope, Dryden, especially as poet. The place of his labor with regard to the grand illustrated histories of Asia, America and Africa, are much in the tradition of Kircher and other encyclopedists who gathered all available data and published times that brought together all that was known or told of these regions. Brunet IV, 174; Cox I, 275; DNB, XIV, pp. 908-911; Wing O-166. EXTRA POSTAGE WILL APPLY. 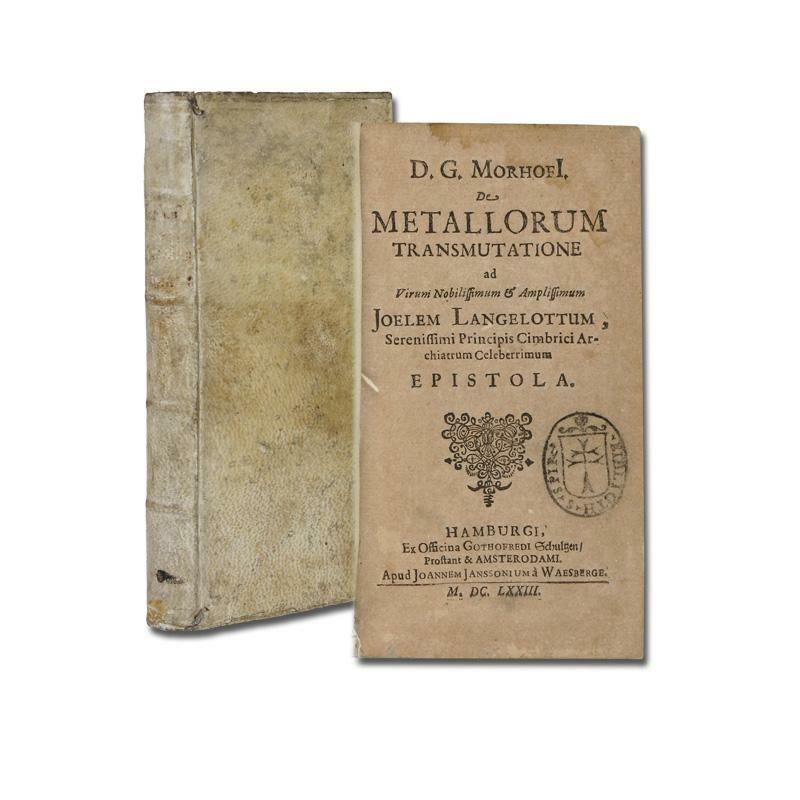 De metallorum transmutatione ad . Joelem Langelottum, Serenissimi principis cimbrici archiatrum celeberrimum epistola. 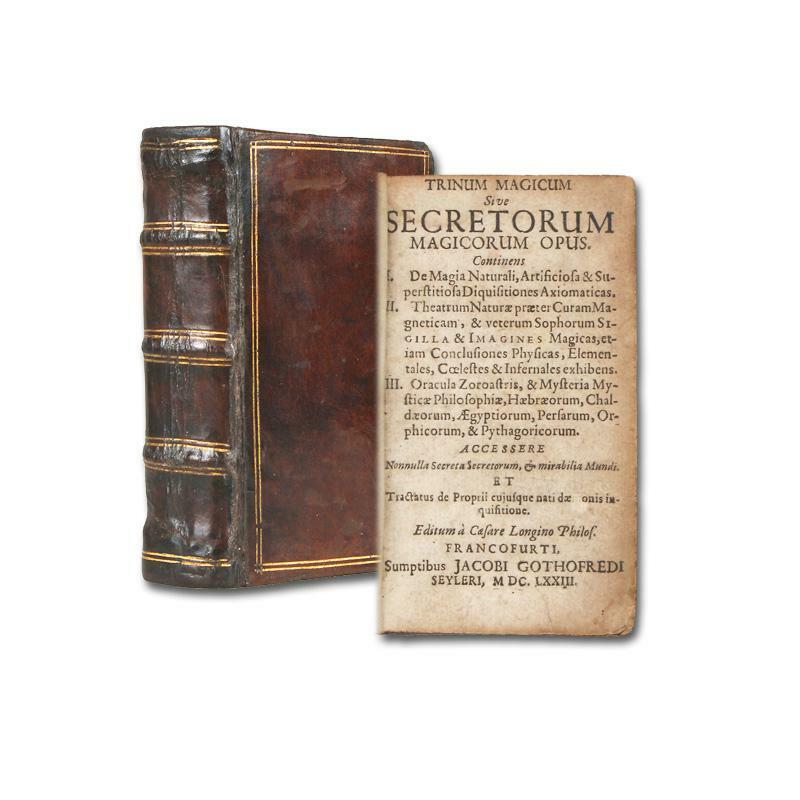 Trinum magicum, sive secretorum magicorum opus. Paris: Jean Baptiste Coignard, 1673. Hardcover. Very Good. Vitruvius's famous ten books of architecture (De architectura libri decem). Folio, 43 x 29 cm. Bound in contemporary French calf, rebacked. 1st French translation by Claude Perrault. 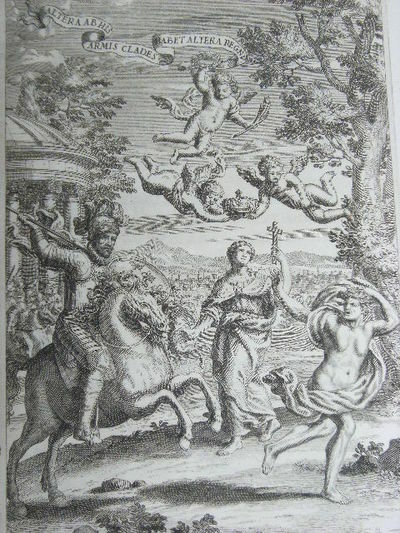 Engraved title by Scotin (after S. Le Clerc). 65 copper plate engravings (55 full page) by Pitau, Tournier, Grignon, etc. Additionally, numerous diagrams and charts in the text. Scattered staining. A scholarly edition of Vitruvius's work. Refs: Brunet V:1329; Cicognara 727; Fowler 418; RIBA 3512. <br> De architectura was the most significant work on architecture to survive classical antiquity. It was highly influential on European design and found a resurgence in the Renaissance in work of Leon Battista Alberti, Leonardo Da Vinci, Michelangelo, Bramante, Vignola, Palladio, etc. Vitruvius's work became the nucleus of classical design in architecture. "By exemplifying the principles of classical architecture "De architecture" became the fundamental architectural textbook for centuries" (PMM). This is an oversized or heavy book, which requires additional postage for international delivery outside the US. Herrn Christian Wolffens, Hochfürstl. Heßischen Hoff-Raths und Prof. Philos. & Mathem. Primarii &c. Meinung von dem Wesen der Seele und eines Geistes überhaupt; und D. Andreas Rüdigers Gegen-Meinung. Leipzig, J. S. Heinsius 1727. 8°. 16 Bll., 335 S., 8 Bll., Prgt. d. Zt. mit hs. RTitel. 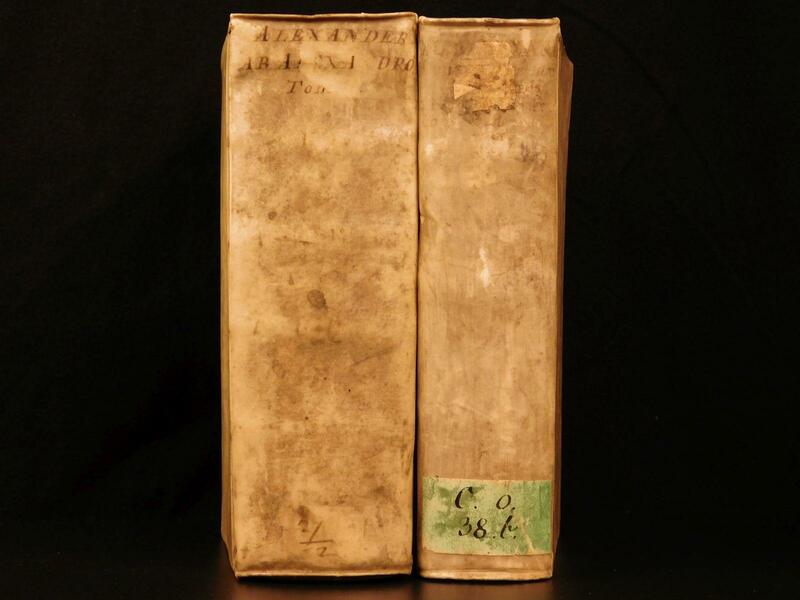 - ADB XXIX, 467 f.- Erste und einzige Ausgabe, selten.- Andreas Rüdigers (1673-1731) explizite Auseinandersetzung mit dem Begriff der Seele als dem Kern und der Grundlage der Wolffschen Metaphysik und Moral. Nach einer kurzen historischsystematischen Einleitung ist der entsprechende Abschnitt aus Wolffens "Vernünfftigen Gedancken von Gott, der Welt und der Seele" (§ 727-927) Wort für Wort abgedruckt und unter dem Text mit Rüdigers ausführlichen kritischen Anmerkungen versehen. Rüdiger lehnte die prästabilierte Harmonie ab. Die Seele ist ihm zufolge "geistig und einfach, aber doch ausgedehnt und insofern materiell. Seele und Leib stehen miteinander in Wechselwirkung. Es gibt Menschen mit mehreren Seelen" (Eisler, Phil.-Lex. 616).- Titel verso u. 2 Bll. mit kl. Stempel, kaum fleckig, sonst gutes Exemplar. (à la fin) Roma, Typis Nicolai Angeli Tinassi, 1673.. Frontispice + 6 pages non chiffrées + 683 pages + 4 planches sur double page (manque 1 planche) (25x37cm). Vélin de l'époque. Coins légèrement émoussés. Quelques salissures aux plats. Rousseurs. Mouillures. Assez bon exemplaire. Edition Originale. 5 Superbes Planches dont 4 sur double page représentant de Spectaculaires Batailles. Très Rare. Histoire. Bel in-folio. Belgique. ca. 1673.(). Original ink and wash on laid paper, 27 x 38 cm. Stamped mark, illeg., l.r. Stamped mark of A. Schaller, dated and inscribed on verso. Near fine. London: Printed by T. N. for Henry Herringman...1673. Small 4to., , 85 pp., , ornamental initials and headpieces. 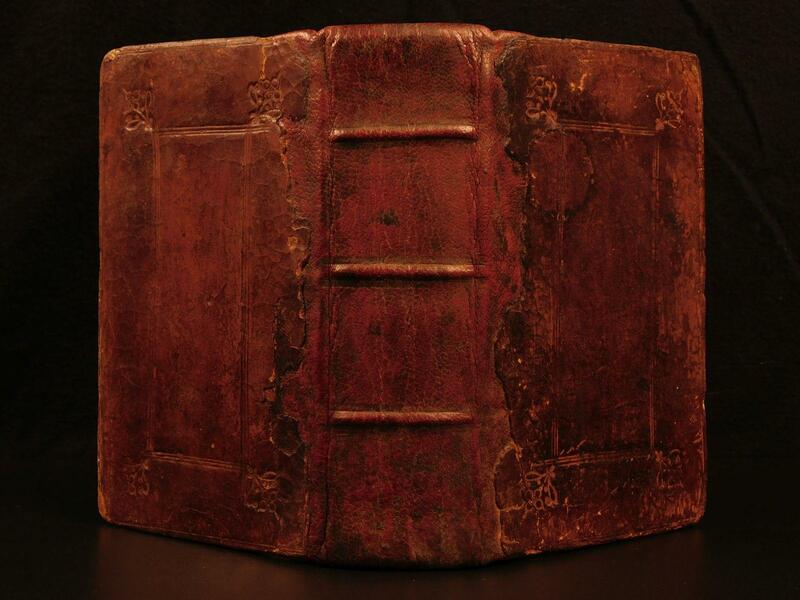 Later blind-stamped full brown calf, gilt-stamped title on spine, raised bands. Minor foxing; fine. Bookplates of Herschel V. Jones, Louis H. Silver, and David and Lulu Borowitz (three total). First edition. First performed in 1672. A two part play with unrelated plots. John Dryden (1631-1700) was an English poet, playwright, and critic, known for pieces which engaged a witty rapport with the audience; either flattering or insulting them. Marriage a-la-mode is considered his best comedy. Wing 2306. Oxford, Printed by W. Downing for F. Oxlad Senior, J. Adams, and F. Oxlad Junior, 1673. Folio, , 341, [3, with the first and second blank] pages with numerous decorated initials, woodcuts and engravings in the text plus an engraved map and 3 engraved plates (one a folding panorama); the main title page is printed in red and black. Of more than passing interest is the fact that the large illustration (160 x 105 mm) on page 264 is printed upside down, and another example of it, cut to size, is mounted over it in the correct orientation. Antique-style full calf a little stained along the bottom inch or two; light tidemark to the bottom inner corner throughout; a very good copy. The first combined edition, with the second title page at page . Significantly, the main title page carries the contemporary ownership signature in ink of Thomas Killigrew (1612-83), English dramatist and theatre manager. The two annotations and seven words underlined in pencil in Juvenal's Satire VII (pages 133-138) may well be in his hand. Remembrances for Order and Decency to be Kept in Super House of..
1673. House of Lords; London, c.1673. House of Lords; London, c.1673. Manuscript c.1673 Parliamentary Manual for a Member of the House of Lords [Manuscript]. [Great Britain] [Parliament]. [House of Lords]. Remembrances for Order and Decency to be Kept in Super House of Parliament, By the Lords when His Ma[jes]tie is not There; Leaving the Solemnities Belonging to His Self Comeing to Be Marshalled by Those Lords to Whom it More Properly Apertains. [London, c.1673]. 83,  pp. Octavo (5-1/4" x 3"). Contemporary morocco, recently rebacked, gilt frames with corner fleurons enclosed by gilt rules, gilt-edged raised bands to spine, all edges gilt. Negligible light rubbing to boards, moderate rubbing to board edges, corners bumped and somewhat worn, front hinge cracked, rear, rear free endpaper lacking. Content in fine secretarial hand to rectos and versos of most leaves. (32 are blank.) Negligible light toning to interior. A well-preserved item. $1,500. * With an index. This is a fair copy of a compilation of parliamentary procedure and rules of conduct for a member of the House of Lords extracted from the journals of that house. The latest order is dated 1673. OCLC and COPAC record a small number of similar manuscripts from the eighteenth century, but only a few compiled before 1700. Historia de rebus in Gallia gestis ab Alexandro Farnesio Parmae, et Placentiae Duce III. supremo Belgii Praefecto. - Antique master prints, titled: 'Ausfuhrliceh Vorstellung und Abbildung der ercschreclichen und abscheuligen Tyrannen welche das Schraurigen Volck im Haag verubet.' 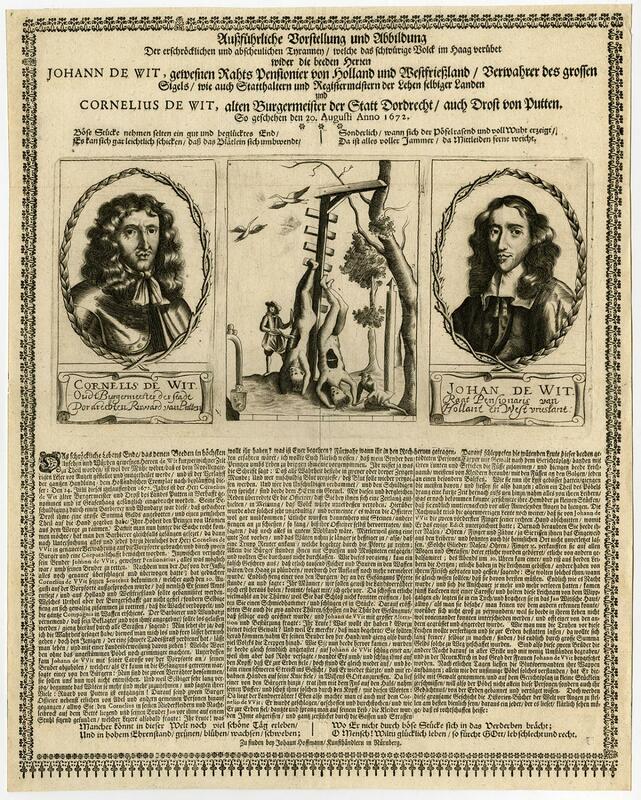 - Pamflet / broadside concerning the murder on Johann and Cornelis de Witt. Engraving and letterpress on laid paper. Watermark: Eagle = Southern Germany, ca. 1670. Description: State: Only state. Ref: FMH 2420B. 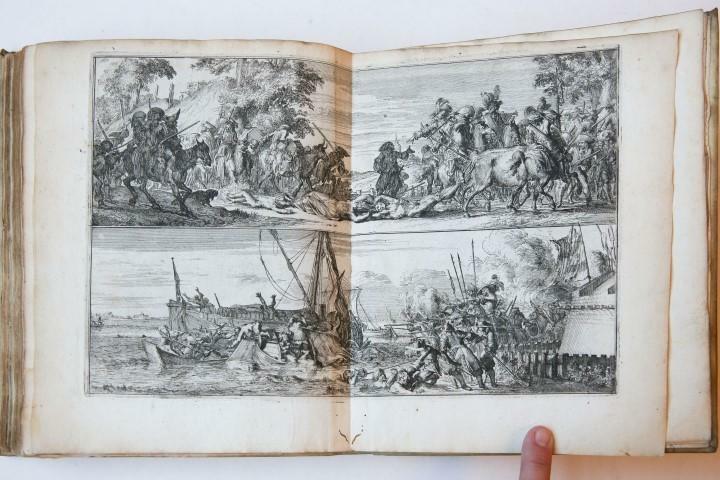 Provenance: Very rare pamflet!Artists and Engravers: Made by 'Anonymous' after an anonymous artist. Anonymous, published by Johann Hoffmann in Nurenberg. Condition: Very good, given age. Thread margins, some old folds. General age-related toning and/or occasional minor defects from handling. Please study scan carefully. Storage location: R1-026 LATPC The overall size is ca. 12.4 x 15.6 inch. The image size is ca. 12.4 x 15.6 inch. The overall size is ca. 31.4 x 39.5 cm. The image size is ca. 31.4 x 39.5 cm. unpaginated: pp. , The best (fifth & last) edition of the first important (but second to be published overall) English language / French dictionary. Its first appearance was in 1611, with this edition adding hundreds of words, the 'Animadversions,' and the 'Refinements according to Cardinal Richelieu's late Academy'. No quire or gathering "E" as usual (text continuous). 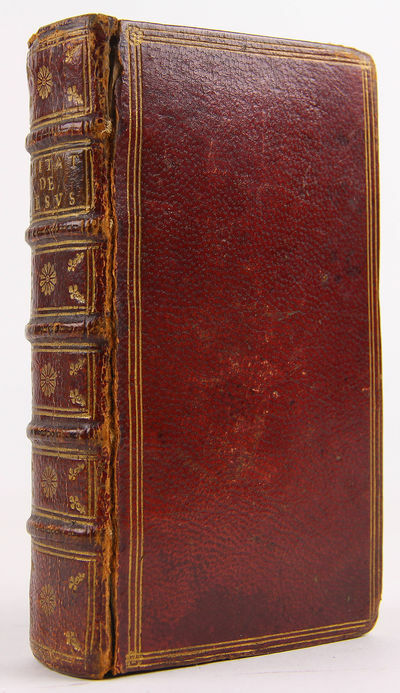 Separate title of Robert Sherwood's part, Dictionaire Anglois & Francois, dated 1672. 1673. House of Lords; London, c.1673. Manuscript c.1673 Parliamentary Manual for a Member of the House of Lords [Manuscript]. [Great Britain] [Parliament]. [House of Lords]. Remembrances for Order and Decency to be Kept in Super House of Parliament, By the Lords when His Ma[jes]tie is not There; Leaving the Solemnities Belonging to His Self Comeing to Be Marshalled by Those Lords to Whom it More Properly Apertains. [London, c.1673]. 83,  pp. Octavo (5-1/4" x 3"). Contemporary morocco, recently rebacked, gilt frames with corner fleurons enclosed by gilt rules, gilt-edged raised bands to spine, all edges gilt. Negligible light rubbing to boards, moderate rubbing to board edges, corners bumped and somewhat worn, front hinge cracked, rear, rear free endpaper lacking. Content in fine secretarial hand to rectos and versos of most leaves. (32 are blank.) Negligible light toning to interior. A well-preserved item. $1,500. * With an index. This is a fair copy of a compilation of parliamentary procedure and rules of conduct for a member of the House of Lords extracted from the journals of that house. The latest order is dated 1673. OCLC and COPAC record a small number of similar manuscripts from the eighteenth century, but only a few compiled before 1700. 4to, Eng. 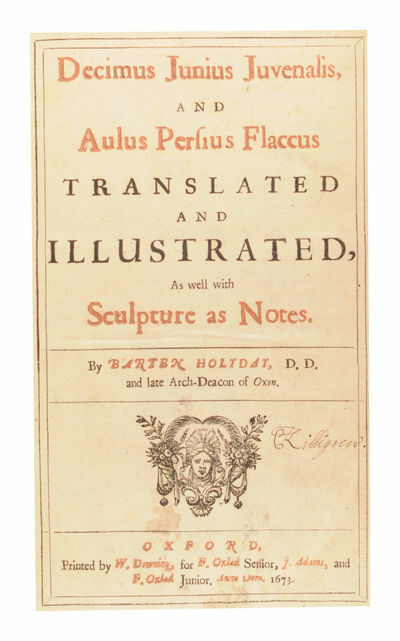 frontispiece by Tardieu after Coypel, xlii, 358,  pp, vignette on title page and 100 engravings in text by Cochin, Gillot, Edelinck, B. Picart, Simoneau and Tardieu after Coypel, Gillot, Edelinck, B. Picart and Ranc, contemporary French red morocco, 3-line gilt fillet borders with small corner ornaments, fully gilt spine with two olive morocco labels. spine very worn and sometime repaired at head. "Très belle édition rare et recherchée" - Cohen / de Ricci [p.594] The book is famous for the suite of 100 exquisite engravings, 68 of which were designed and engraved by Claude Gillot (1673-1722), the great master of Watteau; Gillot's engravings have long been recognised as the first significant book illustrations of the 18th century. Remembrances for Order and Decency to be Kept in Super House of. 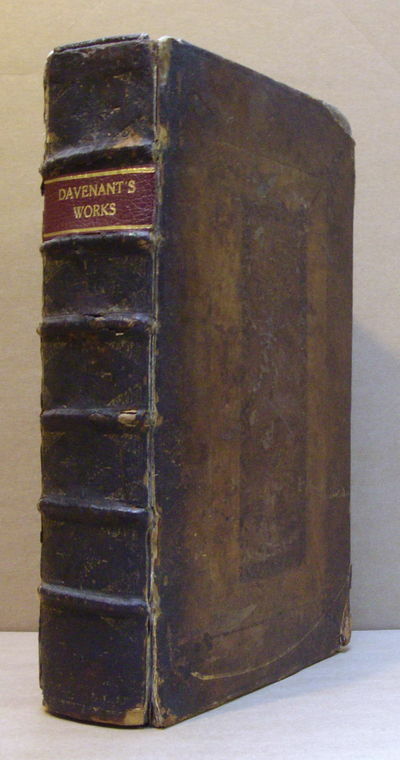 The Works of Sr William Davenant Kt Consisting of Those which were formerly Printed, and Those which he design'd for the Press: Now Published Out of the Authors Originall Copies. Henry Herringman, at the Sign of the Blew Anchor, London., 1673. First edition. Small folio. pp. [viii], 402, 111, [iv] 486. Engraved frontispiece portrait of the author showing his nose badly disfigured by syphilis. Contemporary calf, raised bands, new title-label. 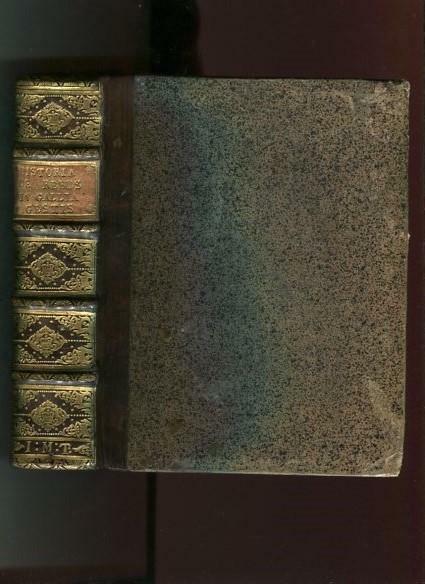 From the Library of George Rylands with his bookplate on front pastedown. The author was baptised by William Shakespeare. Samuel Butler made the comment: "It seemed to him (Davenant) that he writ with the very same spirit that Shakespeare (did), and seemed content enough, to be called his son." Davenant did little to dispel the rumour. Ownership signature on title-page dated 1715. Corners rubbed. Spine rubbed and cracked and split at the joints. Good. The binding is still tight, the contents bright. Descriptions des Plantes de l'Amérique. Paris: L'Imprimerie Royale, 1673. First edition, first issue with the incorrect date MDCCXIII on the title page (but the correct date on the colophon). This is a fine copy in an untouched contemporary binding. Plumier was the first 'modern' botanist to describe the flora of the Caribbean at a time when natural history underwent significant qualitative changes as a result of European expansion and transatlantic contacts. He made three separate expeditions to the Caribbean, in 1689, 1693, and 1695. On the first of these he accompanied physician Joseph Surian; on the last two he travelled alone as botaniste du roi. He discovered, drew, and described hundreds of new species, and left behind over 6,000 detailed drawings of West Indian plants. Many of Plumier's generic names were adopted by Linnaeus and are still in use today, among them Fuchsia, Caesalpinia, and Magnolia. The present work, based on his second trip, was his first botanical publication. Included are many plates showing ferns and clematis. "Le Père Plumier, a monk in the order of St. Francesco di Paula, was an important botanical traveller. Tournefort and he became friends and they herborized together throughout the Midi. After that, Plumier's travels included the Antilles and several long voyages to other islands in the West Indies and to America, where he discovered, drew, and described hundreds of new plants, many of which are shown in his own books, though much of his work had to remain unpublished until Boerhaave and Jean Burmann were able to edit part of his papers, and publish them as the Plantarum Americanarum Fascisculi X in 1755-60" (Hunt). "Plumier was one of the first naturalists interested in the Antilles. He is known for his excellent descriptions and drawings of a great number of species. Although Plumier's herbarium was lost in a shipwreck, his drawings and Surian's herbarium on which Plumier collaborated are extant. Plumeria, an American tree or shrub of the family Apocynaceae, was named in honour of Plumier" (DSB). The present volume is one of three early publications of the French Academy of Sciences, grouped together as Dibner 84. "Printed at the royal press in small editions, they were intended as gifts for the King and Academy. 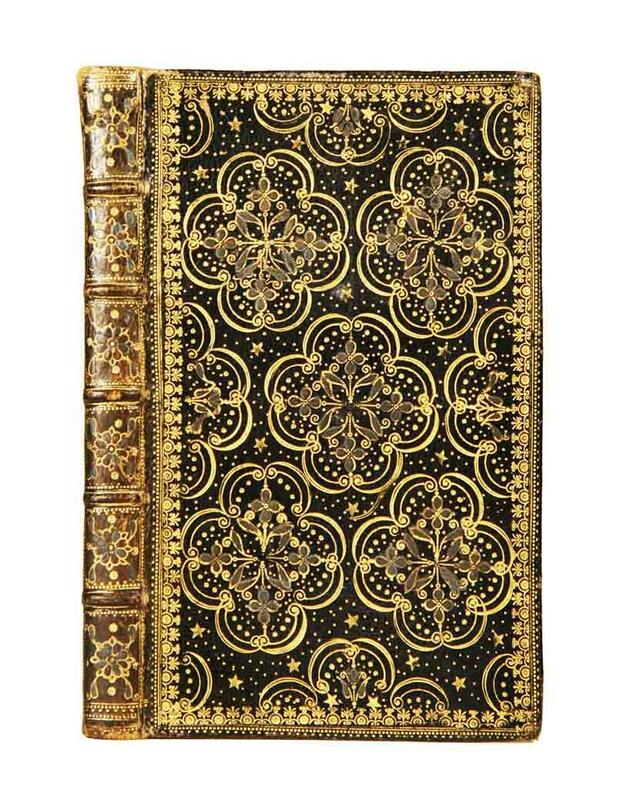 In size, binding [some copies − e.g., Haskell Norman's − are bound in contemporary calf with the arms of Louis XIV blocked in gilt on the covers] and beauty of the plates, they are among the most sumptuous books in science" (Dibner). Only three copies listed on ABPC/RBH in the last quarter-century (one second issue, the other two not specified). The two other copies currently being offered in the trade are both second issue. Plumier (1646-1704) received his holy orders at the Franciscan order of the Minims when he was 16. He studied mathematics, physics and scientific instruments in Toulouse, where he also became skilled as a draftsman, painter and wood turner. Plumier received formal training in the science of botany at the French monastery of Trinità dei Monti in Rome, first under the guidance of Father Philipp Sergeant and later by Franciscus de Onuphriis and the Cistercian botanist, Paolo Boccone. On returning to France, Plumier studied with the famous French botanist Joseph Pitton de Tournefort (1656-1708). He accompanied Tournefort on botanical expeditions and he later went on to explore the coasts of Provence and Languedoc. In 1689, the Marseille Intendant of the Galleys, the French government gave Josephe Donat Surian, a physician, the task of finding a botanist to accompany him to the French Antilles (Martinique, Guadeloupe and Haiti) in 1689 and 1690. Surian choose Charles Plumier, both an excellent botanist and engraver. On the journey Surian focused on the medicinal properties of the plants while Plumier documented and classified the physical aspects of the plants. During this journey they became shipwrecked, and Plumier lost his herbarium containing all his seeds, pressed flowers, and dissected portions of animals. Fortunately, however, Plumier had sent his drawings, together with Surian's herbarium, to France on another ship. At the end of the eighteen-months' journey, the two men quarrelled and Plumier published his results alone on his return to France, as the present work. Plumier later named a genus Suriana in honor of Surian, who died in 1691. Based on the success of this first expedition, Plumier was appointed botaniste du roi by Louis XIV in 1693, and given the support for a second voyage to the French Antilles, on which he spent six months gathering over 924 new species of plants leading to the discovery of 100 new genera. From his observations in Martinique, Plumier proved that the cochineal, used to create an intense scarlet dye used in the European textile trade, should be classified as an insect. On his third voyage, in 1695, Plumier visited Guadeloupe and the foothills of Santo Domingo, as well as Martinique. It was here that he discovered the Fuchsia as well as many ferns. These findings were published in his Nova plantarum Americanarum genera (1703-1704). In 1704, when about to start on his fourth journey, Plumier was taken ill with pleurisy and he died at the age of 58 at Puerto de Santa Maria near Cadiz, Spain. At his death Plumier left a work in French and Latin ready to be printed entitled Traité des fougères de l'Amérique (1705), which contained 172 plates, as well as thirty-one manuscript volumes containing notes and descriptions, and about 6,000 drawings, 4,000 of which were of plants, while the remainder reproduced American animals of nearly all classes, especially birds and fishes. The botanist Herman Boerhaave had 508 of these drawings copied at Paris; these were published later in a hommage by Burmann, Professor of Botany at Amsterdam, under the title: Plantarum americanarum, quas olim Carolus Plumerius botanicorum princeps detexit, fasc. I-X (Amsterdam, 1755-1760), containing 262 plates. Plumier's ambition was to replace the confusing multitude of names given to New World plants with a universal taxonomically based nomenclature. His modernity and scientific ethos manifest themselves in his neutral way of organizing the plants according to a taxonomic system and his use of a Latin nomenclature, often naming plants after well-known botanists: Fuchsia triphylla flore coccinea after the German botanist and physician Leonhard Fuchs (1501-1566); Begonia after the commander of the Port of Marseille, called Begon; Magniolia grandiflora, after Pierre Magnol (1637 - 1715), director of the Botanical garden of Montpellier, and creator of the botanical concept of 'family'; Lobelia, after the botanist Mathias Obel (or Lobel, 1538 - 1616). Plumier never named a plant after himself, but the genus Plumeria, which belongs to the family Apocynaceae and is indigenous in about forty species to Central America, was named by Tournefort and Carl Linnaeus (1707-78), the Father of Botany, to honour Charles Plumier's contribution to the subject. In 1701, Plumier published his L'Art du Tourner, the first work to explain in detail the technology of turning (as with the modern lathe). It was translated into Russian by Peter the Great. Dibner, Heralds of Science 84; European Americana 693/137; Hunt 389; JCB p. 275; Nissen BBI 1544; Pritzel 7213; Sabin 63455. Folio (422 x 268 mm), pp. [viii], 94, [10, the last blank], with 108 leaves of engraved plates after drawings by Plumier, large engraved title vignette, engraved headpiece and initial. Contemporay calf, 20th century ex-libris to front pastedown, 17th or 18th century engraved ex-libris pasted to verso of title. A very large and fine copy. Emblesmes royales a Louis le Grand.Paris, Claude Barbin, 1673. 8vo. 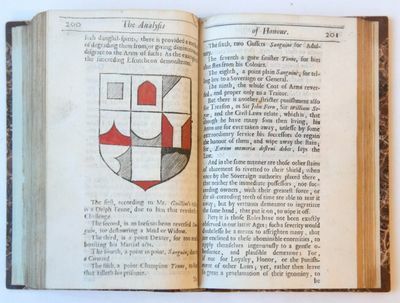 With 60 numbered half-page engraved emblems and one unnumbered emblem on extra inserted leaf. Modern marbled boards. Landwehr, Romanic emblem books 504; Praz, p. 414; Saunders, The 17th-century French emblem, p. 7. First and only edition of an emblem book devoted to the Sun-King Louis XIV of France. The book is nicely produced with a woodcut vignette on title, little woodcut initials, large woodcut tail-pieces, and with borders built up out of ornamental cast fleurons underneath each emblem. And at the end of the dedication to Louis le Grand, the King's personal emblem, a woodcut sun, is added. The engraved emblems depict ancient gods and heroes, plants, animals, buildings, scenes of battle, etc. and are followed by brief poems in French. Unfortunately the second leaf is lacking, containing a poem titled "L'Arc de Triomphe", however, our copy does include the rare extra inserted emblem to Madame de Longueville. Lacking leaf A2. Some occasional minor foxing, title-page restored in the gutter and last leaf restored at the lower outer corner. Otherwise in good condition. Honor rediviuus, or an analysis of Hono[sic] and Armory. Cappellae Regiae ac Collegiatae S. GEORGII in Castro de WINSORE.... (kasteel Windsor). 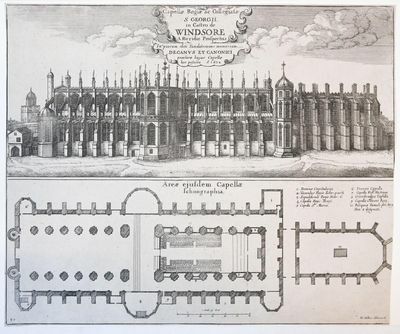 View of St George's Chapel at Windsor Castle, with two cartouches above; tower with domed turret in background at left; below, ground plan of the same chapel; illustration to William Dugdale's 'Monasticon Anglicanum' III (London: 1673, p.87); Upper image lettered in top cartouche with title, in cartouche below 'In piorum olim [...] hoc posuere, Ao 1671. '; lower image lettered with title, parts of chapel numbered 1 to 10 within image and listed at top right, at lower right 'W: Hollar delineavit,' and at lower left with page number '87'. Etching on paper, trimmed within plate mark; total: 296 x 356 mm; Hollstein 2263; Pennington 1076 in very good condition. "Honor rediviuus, or an analysis of Hono[sic] and Armory.&#11;". London, H. Heringman, 1673. 4o. Modern half leather with marbled boards. Exlibris Daniel de Bruin (etching). (3)+345+(5) pag. Trimmed a little tight at the top, a minor restoration to the frontispiece, some small stains inside, else a good copy. Illustrated with a frontispice, engraved titlepage (by R. Gaywood), 9 full page engraved plates of natoble persons in their robes and several mainly hand coloured woodcuts of coats-of-arms. With a handwritten index at the end. This book first explains the idea of honour and then explains the families that recieved noble titles as result of their honourable conduct. Many coats-of-arms are depicted. The book also lists the orders of knighthood, the several houses, inns of court, chancery and other hostels in the city of London. Rare edition. H144. Adelyk Tooneel of Historische Beschrijvinge van allerley Trappen van Adeldom, en Ridderlijke Ordens (...). Amsterdam, Hendrik en Dirk Bloom, 1673. Large 4o. Full vellum. Good condition. Exlibris in colour of J.O. Coninck Westenberg. Third edition of De Rouck's Nederlandtschen Herauld. H211. Allegory of the victory of William III in 1673. Allegory of the victory of William III in 1673. The young prince with command staff standing next to the young Hendrik Casimir. 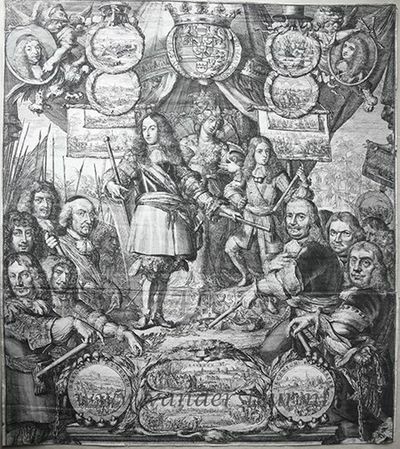 In front of him commanders who gained victories in 1673: Michiel de Ruyter, Cornelis Tromp, Adriaen Banckert, Johan Maurits Paul Wirtz, George Frederick of Waldeck, Rabenhaupt and Duke William of Hornes. Allaround are medallions and cartouches with representations of their victories. On the top left, a portrait of Montecuccoli and at the right Monterrey. "Etching and engraving on paper; almanac on the bottom removed; no margins, some tears along the margins, damages on the upper left corner; total: 532 x 477 mm. Muller 2515a, Landwehr, 90. RdH 202"
"Dusart, Izaak; Jakob van Dael; Hooghe, Romeyn de (1645-1708) "
Optoght der Batavieren, voor de vryheit des vaderlants, zijnde een ontwerp, om [...] hondert duizent weerbare mannen in't velt te brengen. Amsterdam, P. van Eyck, 1673. "Coll. : 4º: A2 B-C4, gepag. : 17  pp. Titelpagina met geëtste prent door Romeyn de Hooghe (1673) en boven de opdracht aan stadhouder Willem III een vignet met diens wapen. Ex. : Papieren omslag. Bibl. verw. : Knuttel 10997; Landwehr 29. In het rampjaar 1672 was de Republiek in oorlog geraakt met Frankrijk, Engeland, Munster en Keulen en dreigde zijn zelfstandigheid te verliezen. In dit pamflet, dat niet alleen in Amsterdam, maar onder meer ook in Middelburg, Dordrecht en Gouda is verschenen, zetten de schrijvers hun plan uiteen om in een tijdsbestek van 14 dagen stadhouder Willem III de beschikking over een leger te geven zonder kosten voor de staat. RdH005". "DRACHTEN; DUURSMA --- Familiepapieren betreffende enige generaties Duursma te Drachten. Manuscripten, foto's, cahiers, brieven etc. etc.". Advis fidelle aux veritables Hollandois. Touchant ce qui s'est passé dans les villages de Bodegrave & Swammerdam, & les cruautés inoüies, que les François y ont exercées. Avec un memoire de la derniere marche de l'Armée du Roy de France en Brabant & en Flandre. [Den Haag], [Daniel en Johannes Steucker], 1673. - 4°, (2)+202 pag., contemporain perkament, geillustreerd met 8 geetste platen over twee pagina's (de laatste twee met elk 2 afbeeldingen) door Romeyn de Hooghe. Enkele wormgaatjes in bovenmarge. C2020 Landwehr 30; Hollstein 90-96; Willems 1874 De Hooghe's schitterende prenten in het 'Advis fidelle' behoren niet alleen tot de hoogtepunten van zijn werk, maar ook tot de artistieke hoogtepunten van dit tijdperk. 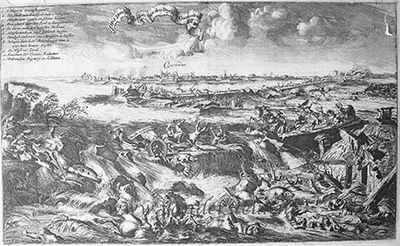 Ze tonen de wreedheden waaraan , 523, e soldaten zich eind 1672 te buiten gingen na de verovering van de dorpen Bodegraven en Zwammerdam. De reeks etsen vormt een aanklacht tegen de oorlog, die vergelijkbaar is met 'The Large Miseries of War' van Jacques Callot en 'The Disasters of War' van Francisco de Goya, etsen waarin eveneens op aangrijpende wijze de gruwelen van de oorlog zijn verbeeld. De schrijver van dit verslag, De Wicquefort (1606 - 1682), verbleef ten tijde van de gebeurtenissen in Den Haag als gezant van de koning van Polen. Daarvoor had hij in Frankrijk vastgezeten op verdenking van spionage voor de Republiek. In 1675 overkwam hem datzelfde in Den Haag, maar nu werd hij ervan verdacht voor de , 523, en en Britten te hebben gespioneerd. Tot levenslange gevangenisstraf veroordeeld wist hij na vier jaar uit de Haagse Gevangenpoort te ontsnappen. Guillaume de Luyne. Hardcover. B074B712ZG In French. 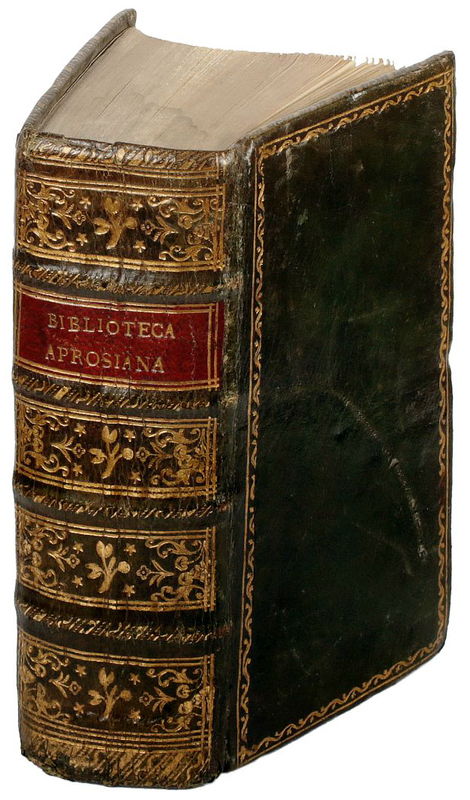 1673 Guillaume de Luyne (Paris), 2 5/8 x 4 1/2 inches tall red full leather bound, triple gilt ruled covers, five raised bands and gilt-lettered brown label with ornate gilt designs to spine, all cover edges gilt ruled, all page edges gilt, gilt dentelles framing marbled pastedowns, marbled endpapers, illustrated with 114 engravings - one for each chapter in the book - along with numerous engraved printer's devices, , 507,  pp. plus original blank front and rear free endpapers. Slight to moderate staining, rubbing and edgewear to covers, especially at tips. Cracking to front exterior hinge, but all holds quite firmly. Abrasion to lower half of front pastedown, perhaps by removal of a bookplate. Slight staining to title page, with scattered light staining and minimal foxing to the contents. 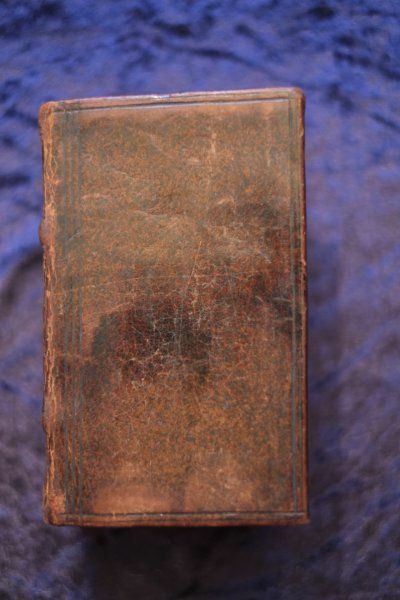 Otherwise, a a very good copy - clean, bright and unmarked - of this rare early illustrated edition of the Corneille verse translation of the devotional classic, The Imitation of Christ. 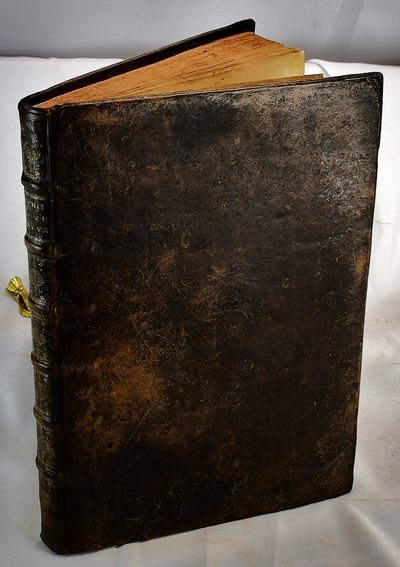 ~KM5~ A 1673 Parisian imprint - illustrated with more than 100 engravings - of dramatist Pierre Corneille's renowned French poetic translation of one of Christendom's most beloved devotion works, The Imitation of Christ. The Imitation, first written in Latin by Catholic monk Thomas a Kempis between 1420 and 1427, has been translated and produced in more distinct editions than any book apart from the Bible. This pocket-sized edition, produced by seventeenth century Parisian publisher Guillaume de Luyne, employs some 114 illustrative engravings - one for each chapter - much like the 'emblem books' which were enormously popular during this era (some produced by this printer). The text of The Imitation of Christ in this edition is the French verse translation by Pierre Corneille (1606-1684), generally considered one of the three great seventeenth-century French dramatists, along with Moliere and Jean Racine. In 1652, Corneille's play 'Pertharite' met with poor critical reviews and he decided to quit the theatre. He began to focus on this influential verse translation of The Imitation, which he completed in 1656. It is still widely considered the best of the several poetical translations of a Kempis' devotional classic attempted over the years. This edition is quite rare - not in COPAC, and OCLC (No. 902325178) locates only one copy at institutions worldwide, held at the University of Antwerp. . Good. 1673. First Edition. Causes celebres et interessantes avec les jugemens qui les ont decidées. 22 delen, Den Haag, Jean Neaulme, 1747-1751. Gebonden in 22 geheel leren banden. Bibliotheekstempeltjes. C0865. "Graesse V 306; Hayn-Gothendorf VI 207; Cioranescu 521; De Feller X pag. 589. Francois Gayot de Pitaval (1673-1743) was advocaat te Parijs en verzamelde in dit beroemde werk een aantal spectaculaire kriminele processen. De nadruk ligt sterk op zaken als echtbreuk, bigami, kindermoord, schaking en ongeoorloofde liefde. In deel I een frontispice waarop men de auteur ziet zitten, omgeven door een aantal juristen. De eerste editie verscheen te Parijs vanaf 1734 in 20 banden. In het midden van de 19de- eeuw verscheen te Leipzig 'Der neue Pitaval. Sammlung der interessantesten Criminalgeschichten aller Länder'. De naam Pitaval was toen dus een begrip voor dit soort lektuur. De Feller heeft weinig op met Pitaval en behandelt hem als een leeghoofdige compilateur."